This article originally appeared in the October 2014 issue of Royal Oaks Living and it is reprinted here with permission. Located on the east side of Napa Valley in the Vaca Mountain range, Pritchard Hill is one of the most picturesque wine regions in California. The vineyards offer stunning views — some overlook Lake Hennessy, while others feature breathtaking views of the valley floor vineyards. The hill was named after Charles Pritchard who settled and made wine there in the late 18th century. Today, Pritchard Hill is a preeminent site for growing Bordeaux varietals, especially Cabernet, which accounts for 92% of the region’s vines. And the wines that hail from the area are some of the best in the state. Pritchard Hill’s vineyards are located on volcanic rock at elevations ranging from 700 to 2,000 feet. And they have the enviable position of sitting above the fog line. The altitude protects them from spring frosts and allows the vines to experience the early morning sun. The lake and southern breezes moderate the temperature, so there is less fluctuation from day to night than on the valley floor. These warmer nights allow even ripening of the grapes. This unique topography also causes Pritchard Hill’s grapes to ripen earlier than other mountain vineyards, which is especially beneficial in cool vintages, such as 2011. Thin volcanic soils with good drainage produce small grapes with thick skins that lead to wines with a lot of flavor. Scarcity of water and soil nutrients force the roots of the vines to burrow deep into the ground and naturally limits yields to one to two tons per acre. But this great terrain comes at a price. Steep rocky slopes, water scarcity and stony soils are just some of the challenges of the area. Fortunately, due to the price and scarcity of land on the valley floor, and the desirability of mountain fruit, many vintners are looking to this area for future projects. Most of the wineries on Pritchard Hill are family owned and some only produce small quantities of wine. There are less than 400 acres planted to vines. Due to the exclusivity and the quality of the wine, this is not an area to bargain shop. The Chappellet family trademarked the name Pritchard Hill in 1971. So you won’t see the name Pritchard Hill anywhere on the bottles, except for Chappellet’s wine. 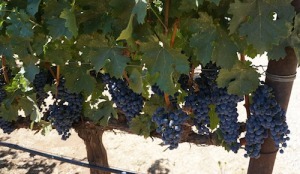 The wines produced on Pritchard Hill use the Napa Valley Appellation. This makes finding wines from this area a bit tricky. Pritchard Hill wines are worth the price and effort, though. Wine Spectator dubbed the area Napa’s Grand Cru — the highest classification of AOC wines from Burgundy, France. The concentration and elegance, along with their expressive aromatics and long-aging potential also make them worth the search. Chappellet: Donn and Molly Chappellet are credited with starting it all when they bought land on Pritchard Hill in 1967, and became one of the first wineries to plant exclusively on high elevation hills. Their vineyards span between 800 and 1,800 feet above sea level, and are sustainable and organically farmed. They grow Cabernet Sauvignon, Merlot, Malbec, Cabernet Franc, Petit Verdot and Chenin Blanc. Brand: A relative newcomer on the Hill compared to Chappellet, Brand’s first release – its Napa Valley Cabernet Sauvignon was offered in September 2012. The winery has 12 acres of vines planted on red volcanic soils overlooking Lake Hennessey. 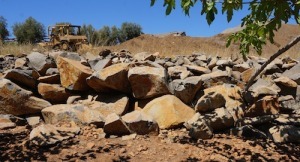 The estate is surrounded by massive boulders that had to be removed with dynamite in order to plant vines. The vineyard includes Cabernet Sauvignon, Cabernet Franc and Petit Verdot grapes at elevations from 1,135 to almost 1,440 feet. Continuum: This winery was started by Robert Mondavi and his children, Tim and Marcia, in 2005 to produce a singe estate wine. Continuum’s 60 acres of vines make it second to Chappellet in size on Pritchard Hill. The westerly aspect and iron-rich volcanic soils produce wines with great structure, focus and age-ability. The vineyard spans between 1,325 and 1,600 feet and includes Cabernet Sauvignon, Cabernet Franc, Petit Verdot and a small amount of Merlot. As of 2012, Continuum is entirely estate grown and bottled. David Arthur: Donald Long and his son, David, cleared the land, built roads and planted grapes on their site in Pritchard Hill in 1978. They harvested their first vintage from the estate in 1985. They have 19 acres of vineyards at 1,200 feet where they grow Cabernet Sauvignon, Petit Verdot, Merlot, Cabernet Franc, Sangiovese, and Nebbiolo grapes. Their flagship wine is Elevation 1147 — a wine made entirely from the estate’s best Cabernet Sauvignon grapes. Gandona: With winemaker Philippe Melka and Jim Barbour, one of Napa most sought after viticulturist, at the helm, Gandona’s wines were destined to be great. The name means “humble man” in Portuguese, and it’s the nickname of the owner’s grandfather, which he eventually also inherited. Manuel Pires purchased the property in April 2006 and the wines and caves were completed in 2010. The winery’s 17 acres are planted on the northwest slope on Pritchard Hill at elevations between 900 and 1,100 feet. The majority of the vines are Cabernet Sauvignon, but they also grow Cabernet Franc, Petit Verdot, Chardonnay and Touriga Nacional — a tribute to Pires’ Portuguese heritage. The winery produces less than 1,000 cases of their Gandona Estate and Encosta wines. Montagna: The name means “mountain” in Spanish and Italian, and it’s an appropriate one. The winery is located on the western edge of the Hill, and the vineyards are planted at 1,150 feet with amazing views of Oakville and the valley floor. The winery started with just 15 acres planted in four vineyard blocks named Montagna, La Presa, Casadores and Triangle, but an additional 18 acres were planted in 2102. Montagna produces four wines: Tre Vigneti Cabernet Sauvignon, Montagna Napa Valley Cabernet, La Presa Cabernet and Triangle Syrah. In addition to Cabernet Sauvignon, Malbec, Petit Verdot, Cabernet Franc, and Syrah are planted on the estate. Ovid: The winery is named after the Roman poet whose most famous work celebrates the themes of transformation and change. Austin Peterson makes the wines with advice from Andy Erickson and Michel Rolland. The property is at 1,500 feet and overlooks Oakville Crossroad and surrounding vineyards. The 15 acres of organically farmed vines were planted in 2000 and include: Cabernet Sauvignon, Cabernet Franc, Merlot and Petit Verdot. Interested in more recommendations on wines from Pritchard Hill or others from around the world? Double Decanted offers a curated collection of bottles at a variety of price points. Let us help you find the perfect bottle – or bottles – for any occasion! To set up an appointment, please email Kelly@doubledecanted.com. Cheers! Subscribe to our mailing list for updates on Double Decanted news, wine specials, and events. We are open for in-store tastings and visits by appointment only. Please call or email us if you would like to schedule a time to visit.